GitHub - tomasbonco/gitlabtree: Browser extension that provides folder structure view for code in GitLab. Browser extension that provides folder structure view for code in GitLab. Want to be notified of new releases in tomasbonco/gitlabtree? Since November's update of GitLab (11.4.5? ), GitLab delivers similar functionality as this extension. That is awesome! But we no longer need this extension :(. Currently it isn't working (as DOM has changed, and I haven't reflected changes), but in short future, I will get rid of the most of the code and will try to enhance new GitLab's solution. I'm removing download links, as I think the extension is no longer beneficial for new users. 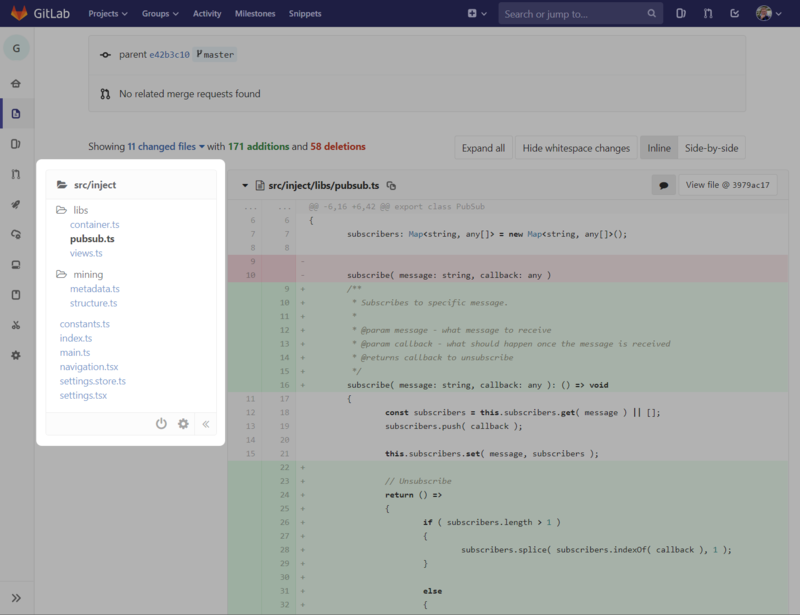 This is browser extension for Chrome / Firefox / Opera (and maybe IE as well :) ) that provides tree view for code in GitLab (must have for code reviews!). Star, if you like :) Open an issue, if you find a bug or you miss something. Send a Pull Request when you decided to extend/fix (thank you for that! ).